Fiddler et Chanteur Country US né le 6 Juillet 1944 à Caldwell (Kansas). Like his contemporary Vassar Clements, fiddler Byron Berline expanded the sonic possibilities of bluegrass, adding elements of jazz, pop, blues, rock and traditional country to the genre. In addition to being a popular solo act, he performed as a session musician on a number of albums, including records by the Flying Burrito Brothers, Stephen Stills, the Dillards, Gram Parsons, the Nitty Gritty Dirt Band, Emmylou Harris, Kris Kristofferson, and James Taylor. Berline learned to play from his father, an old-time fiddler. After graduating from high school, he attended the University of Oklahoma, where he played music with a campus folk group. In 1963, the Dillards played a concert on the University of Oklahoma campus. A friend of Berline's arranged an audition for him with Doug Dillard, who was so impressed he invited the young fiddler to join them for a number. 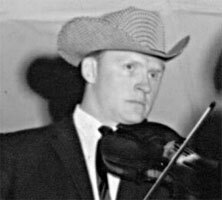 Berline then joined the Cleveland Country Ramblers, and in 1964, he appeared on the Dillards' Pickin' and Fiddlin' and won the National Fiddle Championship in Missoula, Missouri. He played the Newport Folk Festival in 1965, where he met Bill Monroe, who told Berline that he wanted him to join the Blue Grass Boys in the future. In 1967, he graduated with a BA in education, but chose to join Monroe; his first appearance with the band was a show at the Grand Ole Opry. Six months after he joined the Blue Grass Boys, he was drafted into the US Army. Just before Berline was discharged from the Army in 1969, he was invited to join the Dillard and Clark Expedition. He remained with Dillard and Clark until 1971, when the group disbanded. While with them, he played sessions for a number of other artists, including the Flying Burrito Brothers' debut album, The Gilded Palace of Sin. Following the breakup of Dillard and Clark, Berline played with the Dillard Expedition. In 1970, Berline scored the ABC television movie, Run Simon Run, the first of many films he would score. In 1971, he toured with a revamped version of the Flying Burrito Brothers. Following the tour, Berline and fellow Burritos Roger Bush and Kenny Wertz formed the Country Gazette. During this time, he also continued with his session work, appearing on albums by Gram Parsons, Bert Jansch, Ian Matthews and Southern Comfort, and Bill Wyman. In 1975, Berline left Country Gazette and moved to Los Angeles with his family, where he intended to concentrate on songwriting, session work, and scoring films. Later that year, he founded Sundance with Dan Crary, Jack Skinner, John Hickman, Allen Wald, and Skip Conover; the following year, Vince Gill and Mark Cohen joined the band. Sundance recorded one eponymous album in 1976 before disbanding. In the late '70s, Berline recruited Crary and Hickman for a tour of Japan. Following the tour, the trio recorded three albums for Sugar Hill; concurrently, Berline also founded the LA Fiddle Band. In 1980, Berline founded the production company BCH with Crary and Hickman, and released a solo album, Outrageous, on Flying Fish. In 1981, the LA Fiddle Band released an eponymous solo album for Sugar Hill. Berline worked on Chris Hillman's 1984 album Desert Rose and also an album of duos with fiddler Hickman in 1986. Two years later, Berline, Crary, and Hickman changed the name of their trio to BCH and added bassist Steve Spurgin to their lineup. The new incarnation of BCH released Now They Are Four in 1988. The group added mandolinist/guitarist John Moore in 1990; following his addition, the group re-named itself California, and released their first album, Traveler, in 1992. Berline also continued releasing solo efforts.